Zubeida Jaffer is a journalist who was active in the South African anti-apartheid and the trade union movements. She obtained a bachelor's degree in journalism, from Rhodes University in Grahamstown in 1979. The South African authorities detained her for two months in 1980 after exposing police killings. During her detention, she was held in solitary confinement, tortured and beaten. In 1986, after editing community and trade union papers, she was detained again, while she was several months pregnant. She was released at the time of her baby's birth, only to be re-arrested nine weeks later and jailed again with her infant. She headed the media department at University of the Western Cape between 1987 and 1989. Between 1990 and 1995, she became a correspondent for South African and Canadian news agencies. She became a member of the Independent Media Commission for South Africa's first democratic elections in 1994. After this, she went to Columbia and New York City to deepen her skills and received a master's degree in journalism from Columbia University in 1996. She has worked as the group parliamentary editor of South Africa's Independent Newspapers since May 1997, coordinating correspondents that provide daily copy for the chain. She came to the position from another Independent newspaper, the Daily News, where she was political editor from August 1996 to April 1997. 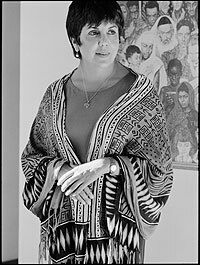 Her work includes: For the Freedom of Our Daughters, in 1997; How the Dutch Dealt With the Traumas of the Second World War: Some Lessons for South Africa, in 1995; History of the Struggle for A Bill of Rights in South Africa, in 1993; and The Story of BiBi Dawood, in 1990. She has won numerous awards in Africa, the United States and Brazil.